Details: Thursday March 8th, 2018, at Revolution Hall (1300 SE Stark St., Portland, OR 97214). Doors will open at 6 pm and show starts at 7 pm. Ticket prices are $17 in advance and $22 at the door. Tickets can be purchased through the link below. Leading independent documentary films from around the world will be screened, focusing on outdoor adventure. The films presented are selected to be particularly interesting for the Portland audience including skiing, mountain biking, and surfing videos. 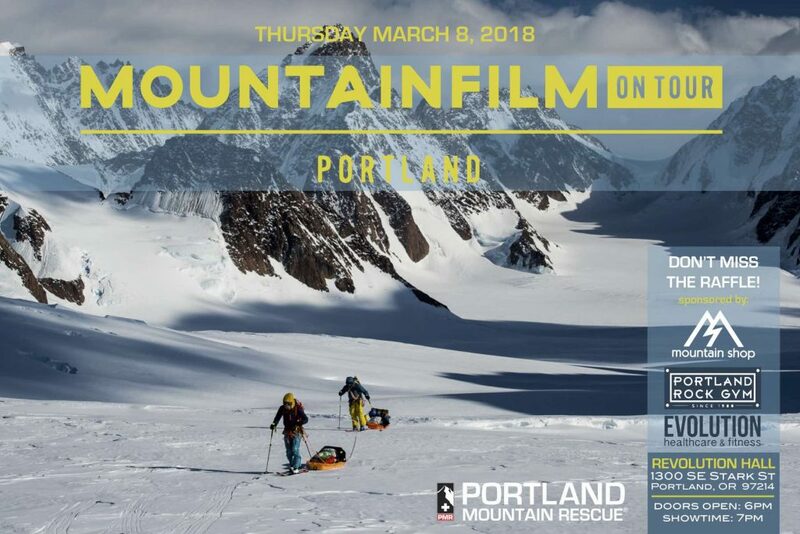 Join us for a night of truly inspirational movies about the outdoors while supporting a great organization — Portland Mountain Rescue! The event will include a raffle of equipment for outdoor enthusiasts. Sponsored locally by Mountain Shop, Evolution Health Care and Fitness and Portland Rock Gym . All proceeds from the event benefit Portland Mountain Rescue. Tickets are $17 in advance and $22 at the door; available online from the link below.